Any Cordovan/maroon plaid seat material? Thanks! if I remember right it's just power, ground and wires running to the other door. While you're at it, grab an extra passenger side bottom cushion to put on the driver's seat. The foam will be in much better shape. A cushion from any style of 84-94 seat will work. You might know that already, but I thought it was worth putting out there. Looks good. In the close-up of the front end, the left frame rail appeared to have a small opening at the top where your new framework mated to the original frame. Is that going to get closed up so it can't get filled up with gunk from following a tow vehicle through snow or mud? As to the axles -- the ring, pinion, and differential spider gears add drag. If these are non-C-clip axles, why not open them and remove the guts, leaving just the axle shafts and the bearings? It'll save some unsprung weight, and reduce drag considerably. Right on, DIY as in....? Never said they didn't work. They do work and work well. Issue is losing clearance. just bought some doors off a 96 Cherokee with electric windows to put on my 88 comanche, how do I wire the windows up? get power and ground etc? You'll get that here my friend. Welcome. Just moved to Puerto Rico and bought an 1986 4x4 Manual with a V6 conversion. The previous owner was a complete hack, but the engine and trans is good and the body straight with minor rust damage. Pretty good for an island car. It basically has no interior and there is a lot of 'cleaning up' to do. This is the first time I am going to restore a car on my own. My expectations from this group are to learn from everyone's experiences and have a support outlet for when I run into trouble dot have questions. Thanks everyone! no pics, sorry. but i got the lower arm stuff welded up on the driver side, and got the bracket made for the driver upper. and the fun part, got to order coil overs today. hoping to have this thing on it's own weight this weekend, hoping. for now i'm just trying to plan accordingly so i can get as much done saturday and sunday as possible. may or may not be driving 3 hours to pick up a topper as well, only because i like the look and I'm young and dumb. jeep is coming out awesome! glad you decided to 4 link it, it's not that bad when you are done with it plus itll drive like butter with the right setup. planning on doing coil overs too or are you gonna do a coil and shock setup? side note, from someone who fabs for a living if you want to remove the factory paint faster than a wire wheel and not remove material like a flap disk a "stripper disk" like benchmark works wonders. don't hit a corner with them, instead of kicking like a wire wheel theyll just wear down super fast. but they do leave nice clean metal which is nice. just incase you were getting tired of wire wheels but they do last a darn long time. your friend is a great welder as well on that front long arm setup. I found the original key to my XJ in the cargo area under the carpet under the spare tire. Spare keys are hidden in some strange places. That is a beautiful Jeep! What are your plans for the truck? Welcome to the addiction! Where to begin? 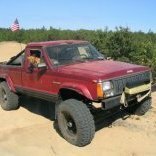 This is my 1988 Comanche Olympic Edition. Has the straight six with what I think is the BA10. It is pretty ruff looking. The PO was a hard smoker. So the interior was pretty much layered in tobacco tar. I had to wipe it down with ammonia to remove it off the dash, steering wheel, doors, etc.. The truck is pretty much rust free. Ive not seen any cancer yet. There was a little rust on the passengers side floor. Easy fix and then painted it with Rust-oleum. The carpet was actually that vinyl floor padding. It wasn't to bad other than having crap all over it and rips, holes worn in it, etc. so in the trash it goes. I prefer using a bench seat. However this bench seat was nasty. It smelled and had stuff spelt on it with food and who knows what else. And yes it was covered in cigarette smoker and tar. I wasn't about to trash the seat. I need to use it until I can either reupholster it, source out another bench seat from a salvage yard ( dodge, chevy, ford, etc..). So I broke the seat down. I removed all the seat covers. The back of the seat was actually incased in a plastic bag. No rips or tears. That saved the back cushion. It looked new and did not smell. The lower cushion was another story. I placed the top and bottom seat covers in the washing machine set on sterilize. I did the same to the bottom cushion. Its still worn but I can fix that my glueing foam and poly batting. Not going to worry about covering the foam with plastic. Here are photos after being washed. I haven't put the bottom together yet. BTW the foam you see under the seats back is it resting on the foam bottom. Damn jeeps. Damn kids. Just when you think your on track..... I haven't built mine yet...clearly, but I do like to dream about the "if I was doing it tomorrow what would I do". At first when I got my MJ I was like let's cut this b*@ch up make a sweet truggy, got a bunch of parts to start building then I started to kind of like just driving it as is. 4 links rear are awesome and if you wheel it should be a nice choice. I've decided I'll never wheel my MJ, they are just too unique and mines in decent enough shape that I'd rather just have a restomod pavement pounder. I'll be keeping leafs but if you can link it go for it! Before my wife decided she was better at spending my money than I was I had this beast. I'll admit I cheated and bought it with most everything done, especially the body work, but the price was so good I just couldn't justify restoring the other one I had.